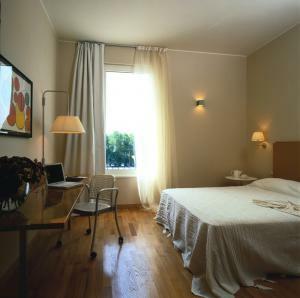 A newly built four-star Hotel, located 2 km north of Milan, in Cinisello Balsamo, within easy access to the main Milan highway. 11 km from the historical center of Milan, 12 km from Milan’s Trade Fair, 7 km from Monza, 37 km from Bergamo, 49 km from Como and Linate Airport in Milan (km. 17) is easy to be reached, Malpensa Airport in Milan (km. 54) and Orio al Serio Airport in Bergamo (km. 41) with an average distance time of 30 minutes.The strategic position within easy access to the international business area of Milan and Lombardy, the supply of a vast number of guestrooms, restaurant services, conference rooms and facilities for parking with a garage for up to 200 cars, make the Cosmo Hotel Palace the focal point for meetings, conferences, gala dinners and important events The Conference center covers an area of 1000 smq splitted in two separate floors and is provided with 13 meeting rooms.